The Angriest: Star Trek: The Next Generation: "Phantasms"
It is 25 October 1993, and time for another episode of Star Trek: The Next Generation. 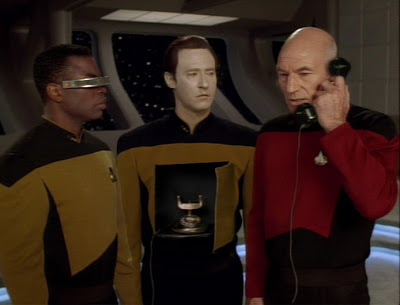 While Picard (Patrick Stewart) tries to avoid going to a tedious Starfleet banquet, Data (Brent Spiner) discovers that his dreaming program has started to give him nightmares instead. "Phantasms" is a terribly messy episode with an awful lot of problems. It involves Data suffering from first bad dreams and then conscious hallucinations, leading to him actually stabbing a crewmate. It then concludes with everything being okay, and the Enterprise saved from harm once again. That feels decidedly false. To reiterate, Data stabs a crewmate in the shoulder - this is a horrifying act that should have serious consequences. That it does not makes the entire episode collapse; it simply is not believable. "Birthright, Part 1", in which Data first started to dream, was a strong expression of a fairly clever idea. Having those dreams transition into nightmares is also a fairly clever conceit, but the executive of it is broadly terrible. It is not simply the lack of consequences for Data's behaviour, but a lot of the detail that is fleshed out as the episode goes on. First and foremost, Data's nightmares are relatively weak and silly, and presented by director Patrick Stewart with a worrying lack of atmosphere. They are impossible to treat seriously, and they don't feel like actual dreams. Instead they feel like a bad Hollywood idea of dreams, in which Counselor Troi (Marina Sirtis) is a cake, and Dr Crusher (Gates McFadden) calmly drinks from Riker's head (Jonathan Frakes) with a straw. If the nightmares do not feel scary, the episode simply does not work. Data goes to get counseling regarding his dreams and their potential meaning, which means talking to Troi - in a scene that is actually rather good - and talking to a hologram representation of Sigmund Freud - in a scene that is superficial, inaccurate and generally terrible. It also beggars belief that in an episode produced in the 1990s - at which point Freud's theories had already been extensively superceded or debunked - a character in the 24th century would consult Freud for advice. Matters are not helped by the episode's depiction of Freud essentially being a one-dimensional cartoon character. The episode's conclusion reveals a weak science fiction reason for Data's dreams that is heavy on technobabble and low on sense. It is a frustrating end to a frustrating episode. This is the sixth episode of The Next Generation's seventh season, and so far only two of the episodes have been good. The quality ratio slips to 34 per cent.